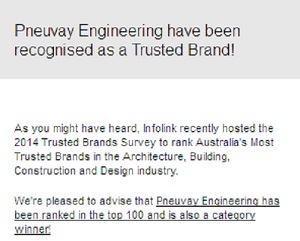 Pneuvay Engineering is proud to announce that it came first in the "Building and Construction Category" and was in the "Top 100 Most Trusted Australian Brands in the Infolink Top Trusted Brand 2014 Survey. The Top Trusted Brands Survey establishes every year the top 100 Australian companies in the Architecture, Building, Construction and Design industry. This year, more than 7000 votes were counted and Pneuvay Engineering have ranked 28th overall in its list of 100 Trusted Brands and 1st in the Building and Construction Category. Write a review about Pneuvay Engineering. Like and follow our Facebook company page to begin. 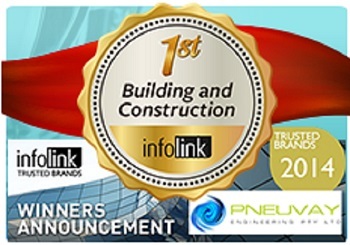 Infolink is one of Australia's largest online directories for architecture, building, construction and design sectors. It has over 14,000 supplier listings and receives 414,000 page views and 156,000 unique users per month in Australia. It provides a comprehensive central online source containing the latest product, company and industry news updates. Pneuvay has a long-standing commitment to giving back to the inner north Melbourne community where we work and live. Our contributions, leadership and volunteer efforts help in the development of a better and stronger neighborhood in which we can flourish and enjoy. Michael Francis, Company Director of Pneuvay Engineering, also acts as Director of Inner North Community Foundation. The Foundation makes grants each year from income derived from a professionally managed perpetual corpus and to date has re-invested more than $1.4 million in the local community, funding more than 90 local charitable organisations. Inner North Community Foundation recently funded 21 projects, to a total of $310,000. Scarf Community Organisation $20,000 Hospitality training and mentoring for refugees and disadvantaged young people in ‘borrowed’ restaurants. Youthworx &nbsp; $25,000 ‘Skill Up’ – Preparing for the Future will create short films made by young people for young people focused on job readiness skills. Do you wish to learn more about the community services supported by Pneuvay Engineering. 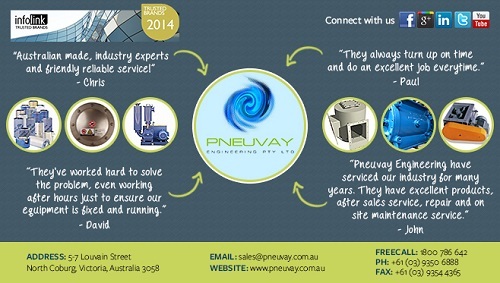 Visit us at http://www.pneuvay.com.au/pneumatic-conveying/our-community/#main-view/.